The North Carolina Coastal Federation and the U.S. Fish and Wildlife Service are working with private landowners to restore 50 acres of Atlantic White Cedar in northeastern North Carolina. Our state was once known for its thriving native Atlantic White Cedar ecosystem throughout the Albemarle-Pamlico peninsula — holding more than half of the original cedar stands on the Eastern seaboard. Today, these cedar forests have declined to less than five percent of their original acreage. 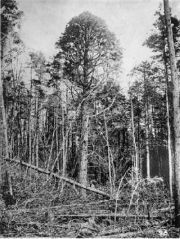 When the Great Dismal Swamp and Alligator River refuges were drained for agricultural use, the numbers of naturally occurring Atlantic White Cedars decreased significantly. Known as “juniper” in North Carolina, these trees were used heavily in boat building and decoy crafts. To help restore these historically valuable ecosystems, the federation is offering an 80/20 cost-share program, where the landowner’s 20 percent can be an in-kind donation. If you have land in northeastern North Carolina you believe may be suitable for Atlantic White Cedar restoration and want to find out more about our program, please contact Erin Fleckenstein at 252-473-1607 or erinf@nccoast.org.